Leeds United midfielder Kalvin Phillips celebrates leveller at Middlesbrough last week. With hindsight we should have known that Kalvin Phillips had it in him. He’s worked under so many coaches at Leeds United and every single one had used him. No matter the changes in tactics or ideas, Phillips has always found a way to make his face fit. New signings haven’t changed that. It’s true to say that good players are good players but I can think of plenty of old team-mates who found favour with one manager but couldn’t make themselves stick under another. When you get into the lower leagues, you’re not talking about elite performers who possess the talent to get a game by default. It’s a judgemental world and the first indicator of Phillips’ character is the fact that he’s survived at Leeds through some very messy years. This season hasn’t been a doddle for him either. 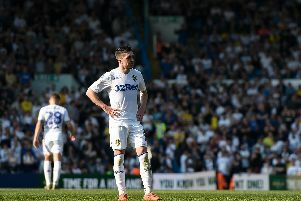 You watch him on a night like Wednesday against Swansea when, quite honestly he looks undroppable – a midfielder who would get into any team in the Championship no problem – but it’s easy to forget the times earlier in the year when Bielsa was hauling him off after half-an-hour or so and sacrificing him when things went wrong. It’s not as hard to take substitutions like that when it’s coming from someone like Bielsa because you know it’s tactical and you know it’s not personal but players are precious and it’s impossible to be the victim of a change like that without imagining a massive sign above your head saying ‘it’s my fault’. That’s when you find out about someone. Does he sulk or does he take it with humility (and again, maybe it’s easier to take the embarrassment with humility when a coach like Bielsa is on the touchline)? How do you react? I’ve dealt with Phillips through my job at Sky and he’s a lovely lad. I don’t want that to sound condescending because it isn’t. He’s polite, he’s honest to a sensible degree and I get the feeling that within the dressing room he’s very well liked. That counts for a lot and over the years I’ve been impressed with the ethos which Leeds seem to nurture in their academy. They’re in the habit of producing well-rounded kids who know their place, understand the importance of experience and genuinely want to learn. Earlier this week we heard of the death of Eric Harrison, the coach who oversaw the old ‘Class of ‘92’ at Manchester United. While no Leeds fan wants to reminisce about Manchester United, it’s worth noting the way in which the players he developed have spoken about him and what they said about the way he looked after them. The best youngsters invariably have the best mentors. They also have the maturity to take lessons as they go. It’s clear that Harrison used the stick as well as the carrot and I don’t doubt that Phillips will have been through the rough and the smooth. I remember days with Paul Hart (who I loved) at Nottingham Forest when it felt like I couldn’t do a sodding thing right, even if I was only cleaning the boots; almost like he was out to get me. Phillips’ career so far has been a slightly slow burn (and I say that realising fine well that he’s only 23). He didn’t have the immediate, sensational impact of a Sam Byram or a Lewis Cook but who could look at all three now and say with certainty that Phillips won’t be the best of the lot? You never can tell with academy players. Neil Redfearn once told me that he believed Alex Mowatt would play in the Premier League and he wasn’t alone there. Mowatt drifted away fairly quickly but Phillips is still there at Leeds and more integral than ever. Bielsa’s work with him has been superb and what I think he spotted early on is Phillips’ talent of playing with the game in front of him. I’ve seen Phillips in different positions over the years, sometimes in a fairly attacking role, sometimes as a very central midfielder, but he’s never looked as comfortable as he does in the holding role. We know he’s a robust, physical animal but he’s technically better than he’s been given credit for and one of his big talents is a willingness to keep things simple. We’d all like to be the one who sends 50-yard balls from point to point, slicing open defences with passes which people rave about on Twitter later but sadly, very few of us are Pablo Hernandez. Phillips’ range of passing is actually very good but there’s no ego in his play. If there’s an easy out to Hernandez on the wing, he’ll take it. If his job involves working the ball into space and leaving others to sound the attack, he’ll stick to it. His goal at Middlesbrough last weekend was his first of the season and, someone said, his fourth effort on target. I love that stat. It’s a great example of someone sticking to his job, despite the temptation to look for personal glory. I’d struggle at this stage to pick out a better holding midfielder in the Championship and at 23, Phillips has become a player who Leeds need to build their team around. We’re bad in England at lauding young players who haven’t made a splash but he’s got over 100 appearances already, he’s having the season of his life and he’s the sort of athletic specimen who looks like he could play until he’s 40. When was Phillips last injured? When does he ever seem like his legs have gone as injury-time comes? Does anybody else think he’s starting to look like a club captain of the future? You don’t want his head to expand but his head never does, which is probably why he’s a Bielsa protege: willing to listen, willing to learn and convinced about the benefits of doing both. People will call him an example to other academy players. There are players beyond his years who could take a leaf out of Phillips’ book too.